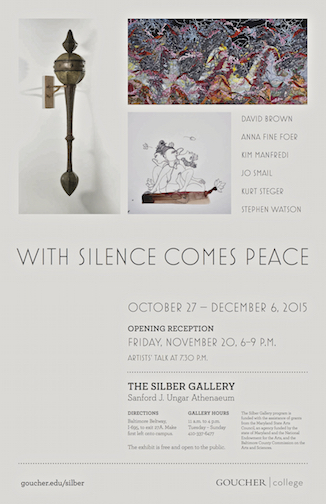 With Silence Comes Peace, an art exhibition about mindfulness, features work by Anna Fine Foer. Opening reception, Friday Nov 20, 6-9 pm, with an artists’ talk at 7:30 p.m.
Goucher College, Silber Art Gallery. October 27, to Sunday, December 6. More info on the exhibit and programs here. Our brains contain a narrative network that holds vast stores of information about our own and other people’s history. When you experience the world using using the narrative network, you take in information from the outside world, process it through a filter of what everything means and add your interpretation. When we percieve a moment in time; the image or spark is the message, an unspoken, percieved message that is transmitted nonverbally. During the Second Temple period (530 BCE – 70 CE), Jews in Palestine and in the Babylonian exile were notified of the new moon’s arrival by fire beacons that were lit across the mountaintops. The new moon signifies the start of every Jewish month. This type of communication is visually linked, in Foer’s collage, to messages sent in our brain; firing neurons. A neuron is an electrically excitable cell that processes and transmits information through electrical and chemical signals. Just a neurons are “fired” sending messages, the fire signals depicted in this collage send nonverbal messages that were recieved and transmitted. The collage Fire Signals Announce the New Moon is made of images of the neural framework collaged onto and into topographic maps of Israel, creating mountains. Fire Signals II is another expression of the concept and design.